This hotel is 100PCT Non-smoking. 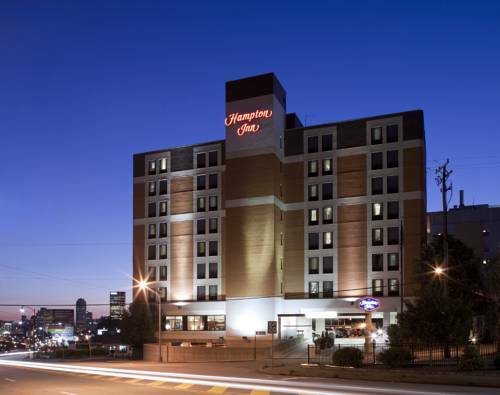 The Hampton Inn Pittsburgh University/Medical Center hotel is conveniently located in the heart of Pittsburgh*s collegiate district off of Pennsylvania Interstate 376. Adjacent to the University of Pittsburgh and Peterson Events Center the hotel is also within one mile of Carnegie Mellon and Duquesne Universities as well as Carlow and Chatham Colleges. Guests of our University Center hotel visiting the nearby Pennsylvania medical community will find themselves just steps from several of the nation*s most respected hospitals. They include the University of Pennsylvania Medical Centers Mercy - Magee Hospital Children*s Shadyside Hospital the Hillman Cancer Center and West Penn Hospital. Local attractions near our Pennsylvania Hampton Inn hotel are Station Square with unique shopping dining entertainment and breathtaking views of Pittsburgh sporting event venues home of the Pittsburgh Steelers Pirates and Penguins famous museums the Carnegie Science Center the Pittsburgh Convention Center Kennywood Amusement Park Sand Castle Water Park and much more. Our Pittsburgh Hampton Inn features 132 beautifully appointed pet friendly hotel rooms offering many amenities including complimentary wireless high-speed internet access a spacious work desk 25 inch cable TV with movie channel and dual line phone with voicemail and data port. The centerpiece of the Hampton Inn Pittsburgh University/Medical Center hotel is its elegant lobby where guests will enjoy a complimentary On the House hot breakfast served daily and where guests have access to business services. Our Pennsylvania Hampton Inn provides complimentary shuttle service throughout Oakland downtown Pittsburgh and the surrounding area from 7am - 10pm. After a busy day hotel guests can work out in our on-site fitness room or a nearby health and fitness center with a guest pass. We love having you here in Pennsylvania at the Hampton Inn Pittsburgh University/Medical Center hotel. All reservations must be guaranteed with a major credit card or adv cash deposit to hotel regardless of time of arrival. All reservations must be cancelled by 24 hours prior to host time unless deposit required. Policy subject to change. An Oakland original serving traditional *Pittsburgh* style sandwiches. Award winning restaurant serves USDA Prime Aged Beef Fresh Fish and Seafood complemented by hand-picked vegetables and elegant desserts.